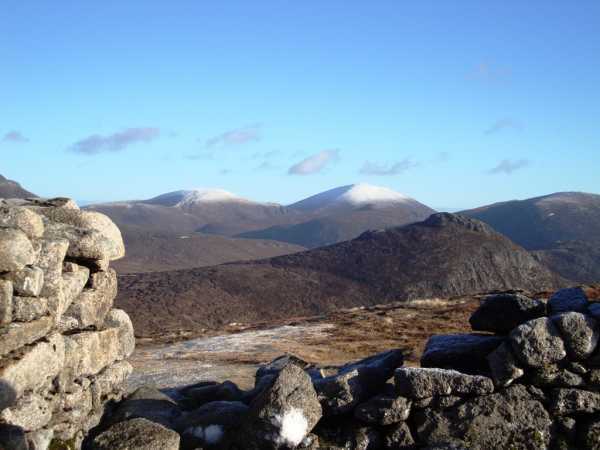 Set off on a simple Ott-Carn-Slieve Muck route on January 6th. Parked at the small car park on the Ott Road at J 280 278 A. A stile across from this carpark gives direct access to Ott mountain along a well established track. The track actually skirts around Ott but the top can easily be tackled using this track. Great views of the Spelga Dam are on offer from Ott and it really is worth the short trip to the summit. The traverse from Ott to Carn can be wet and boggy underfoot but thankfully during a week of hard frost the conditions were very firm and before long we reached the mourne wall.